My cat has been telling me she wants to get more into 32 bit ARM processors. So when ST started freely offering their discovery development board for their new Corex M4, I jumped at the chance. My luck was in and the board arrived today! The STM32F4 on the board has a full meg of flash and a single precision floating point unit! Oh and like a bazzilion hardware timers and lots more. The board itself has a number of sensors and a big LED on it. 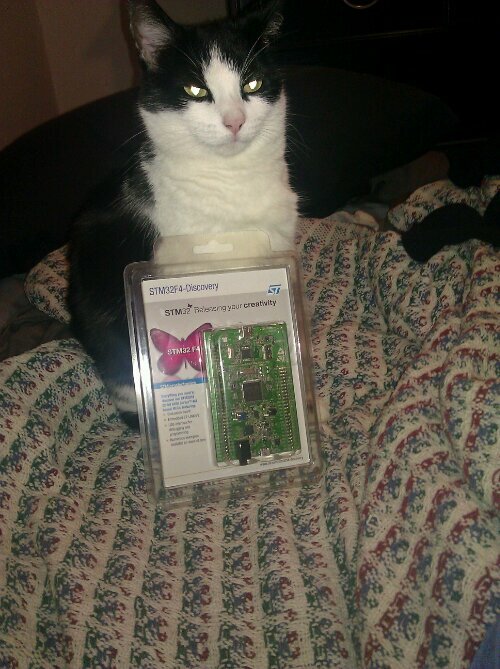 My cat is looking forward to spinning up a compiler and putting the device through its paces. She is especially looking forward to the demo app where the board pretends to be a mouse. This entry was posted in electronics and tagged ARM. Bookmark the permalink. Ahh, I see you received yours today too.